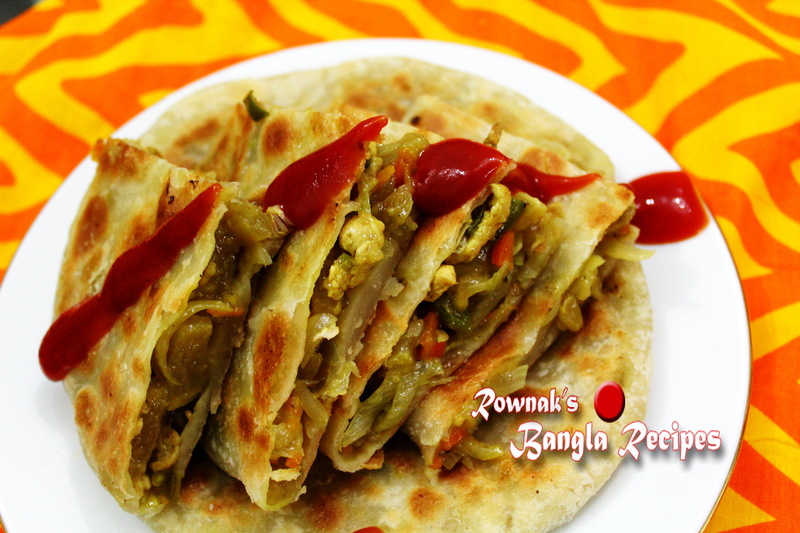 Chicken Parata is a yummy chicken stuffed shallow fried flat bread which can make upon your taste bud . It is perfect for kids and your lunch box. To make it balanced diet, you can add your choice vegetables. I will suggest to use papaya, cabbage, carrot and capsicum. Thanks. Also need oil for rolling and frying parata. Heat 1 teaspoon oil and fry chicken breast with ginger, garlic, pepper and salt. Fry till chicken is cooked. Remove chicken pieces from pan and let it cools down. When it becomes cool, tear the chicken pieces (like shredded chicken). In the same pan add rest of oil and fry sliced papaya with turmeric and salt for 5-6 minutes. Add carrot and cook till everything is cooked. Add cooked shredded chicken, sliced onion, chopped chillies and sugar. Stir well and add cornflour mixed water ½ cup water. Dry up water and all ingredients come together remove from heat. Make soft dough with all ingredients together, knead well. Cover it wet cloth and let it rest at least for 15 minutes. Divide the dough into 4 balls and roll each part balls into 6 inch wide flat bread with. Divide the stuffing into 4 parts and stuff each part of stuffing into each bread. Let it rest for 10 minutes and carefully roll each one 5-6 inch wide flat bread with oil. Heat the pan (if possible take non-stick pan) and fry parata on slow heat. After 2 minutes add 2 teaspoons oil over parata and flip it add 2 teaspoons oil. Fry it till it becomes light golden and brown spots in both sides. Repeat the process with rest of parata. Enjoy yummy Chicken parata with your favourite sauce.